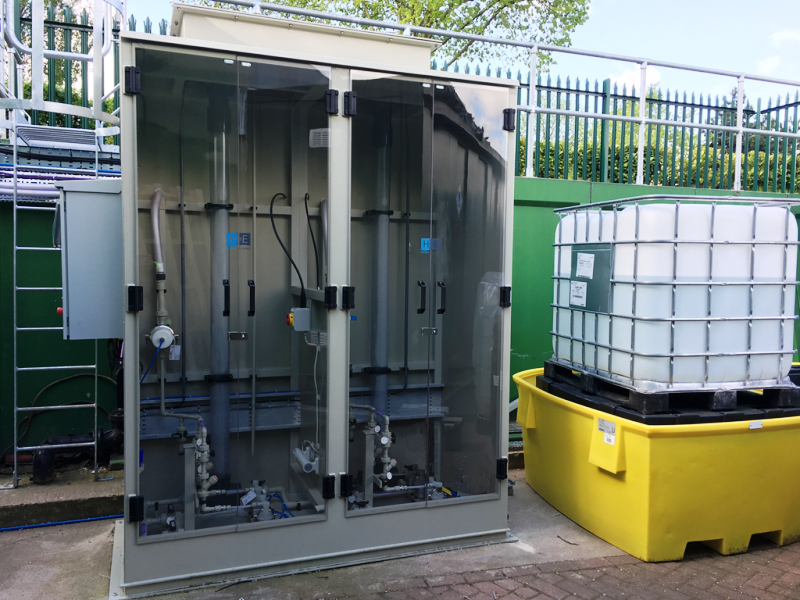 Chemical dosing from IBCs can result in a lot of expensive chemical being wasted. An increasing number of clients find this frustrating, and expensive. The wastage is simply because they have to change the duty IBC to a new one while an operator is available. This is often a problem when an IBC becomes empty overnight. If that happens, then the risk to continuing production is very real! The only way to avoid this would be to have an operator standing by and waiting for the IBC to become completely empty and then changing it instantly! – and even then there will be a short period when the chemical is then not available. H+E’s addressed this issue by developing the SecureChem™ system. It also minimises the hazards to operators when dealing with dangerous chemicals. For this customer, the system handles two different chemicals. It connects two IBCs of each chemical in duty / standby mode. The system automatically switches supply to the standby IBC once the duty IBC is completely empty. When switchover happens the system also generates an alarm to advise that replacement of the empty IBC is necessary. Since each IBC holds 1,000 litres of chemical, it takes some days to consume the chemical. Therefore changing the now-empty IBC is not urgent. In this case, the SecureChem™ system is installed outside. Therefore the enclosure around the unit (that includes a heater) protects against frost, and an alarm advises of any future leakage. Dual-containment pipework provides additional safety when pumping the chemicals through the factory to the point of use. SecureChem™ systems are supplied in a range of materials. This depends on the chemicals used and perhaps on your own in-house requirements. Typically, pipework would be PVC or ABS. However, other materials such as PP, Pe, PVDF and stainless steel are also available.